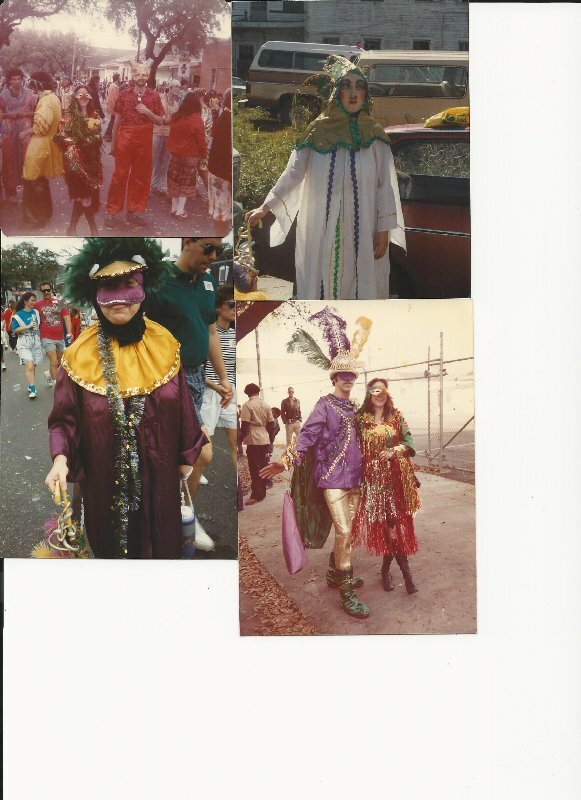 Meg was my Mardi Gras soul mate, we went parading from the mid 70s for the next 35 years and really had a blast decade after decade. 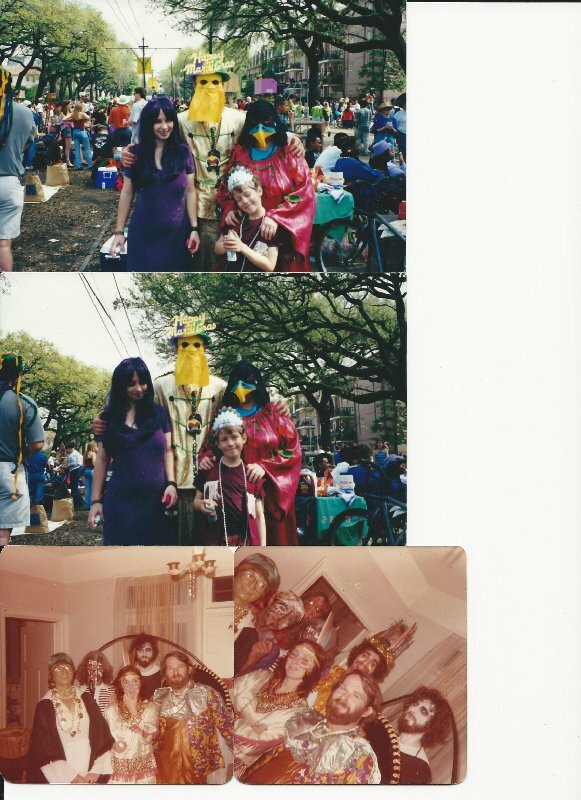 I was very fortunate that she was a kid magnet and we would take our kids and the neighborhood kids on Mardi Gras parade excursions night after night during the season. 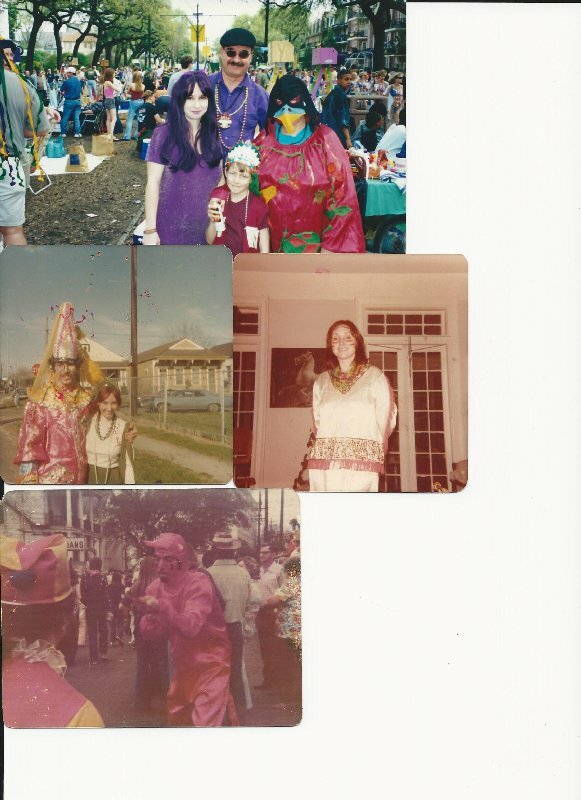 In the late 70s, we crashed the CAC’s Krewe of Clones. 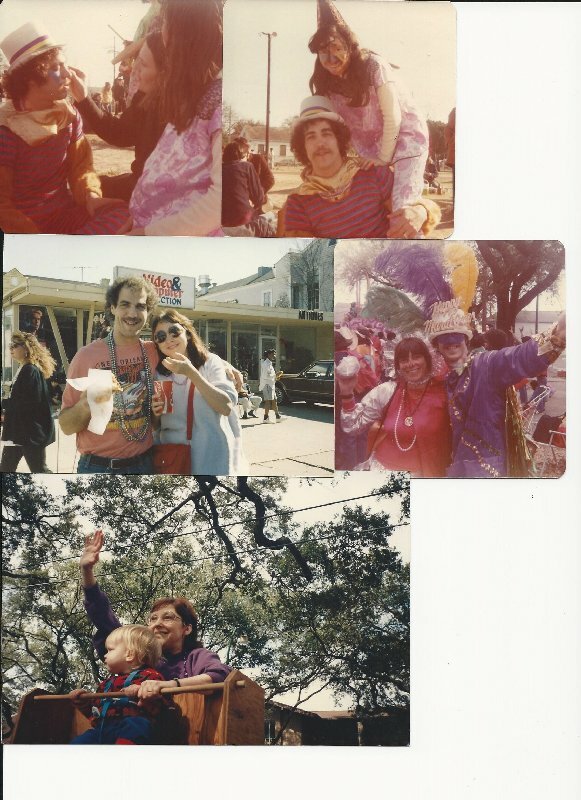 Before there was KdV, there was its predecessor, Krewe of Clones. Clones grew directly out of the Contemporary Arts Center. The CAC ran the parade, and the parade staging area was the CAC parking lot on Camp Street. 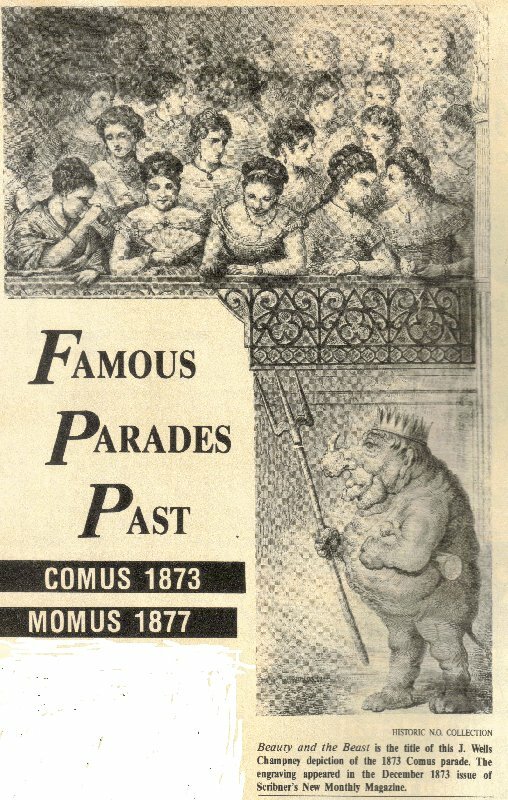 It was an arty, satirical parade from the start. I still have an original1984 Krewe of Clones T shirt with the theme Barbie & Ken go to the World’s Fair. After watching the parade one year in front of the CAC, we noticed the CAC Parade Marshall was drinking heavily over the couple of hours it took the parade to leave the staging parking lot. 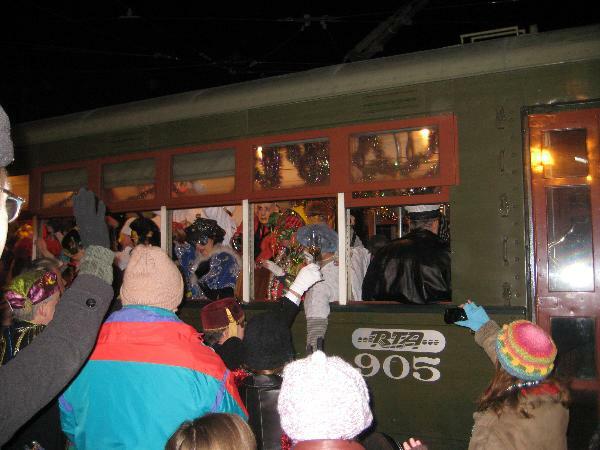 The next year, we hatched a plan to crash the parade with our own float, taking advantage of the Marshall’s inebriation. We decorated our VW van into an elephant float by dying some sheets gray, and constructing a paper mache trunk, ears, and tail. The night of the parade, we drove our float into position next to the CAC. When the parade was almost out of the staging area, we took advantage of the loose formation conditions, and drove our float straight onto the route. The Parade Marshall waved us on. For the next few years, we morphed that old van into other animals, and continued to crash the parade until the Marshall ‘retired’. 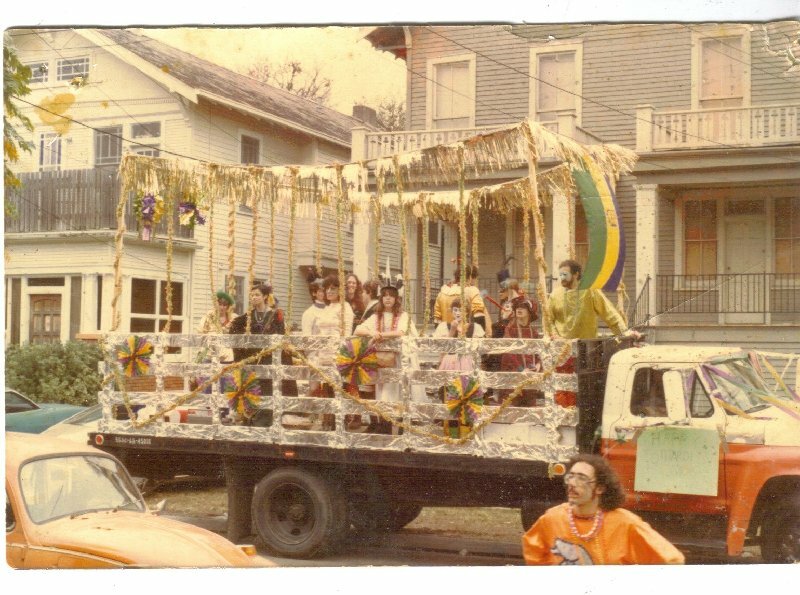 For several years in the mid 1980s, we had our own float in the Tucks parade. We paid the Krewe $500 cash and rented a stake bed truck and built our our cheapo float and invited all our twenty or so out of town Carnival visitors and all the neighborhood children to participate in the parade down Napoleon Avenue and down historic St. Charles Avenue on a Saturday afternoon during Mardi Gras. 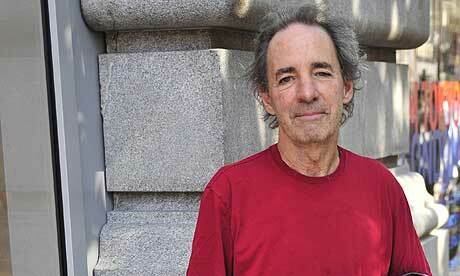 See the photo immediately below. I drove most of the with some help, and Meg rode on the truck and in the cab with me. We had an amazing time! 1979 Mardi Gras Revisited – New Orleans Police Strike!! This was a Mardi Gras to remember. The police strike (NOPD) cancelled the parades in Orleans Parish, but Jefferson and St. Bernard Parishes held all their parades. Much of organized Carnival was canceled in New Orleans, but all of the less organized groups came out as usual. On Fat Tuesday morning we went to the west bank for Grela and the trucks, then headed back over the Mississippi River bridge to find the Wild Tchoupitoulas Indians. We found them, with Chief Jolly, Charles Neville on sax, and Aaron Neville smoking a joint with our little group! We really enjoyed our time with 2nd Chief Norman Bell, Chief Jolly (George Landry), Aaron and Charles Neville, and other Indians and musicians. We were living on Robert Street off of Danneel St, so we were very close to where the Nevilles all lived back then, on Valence Street. 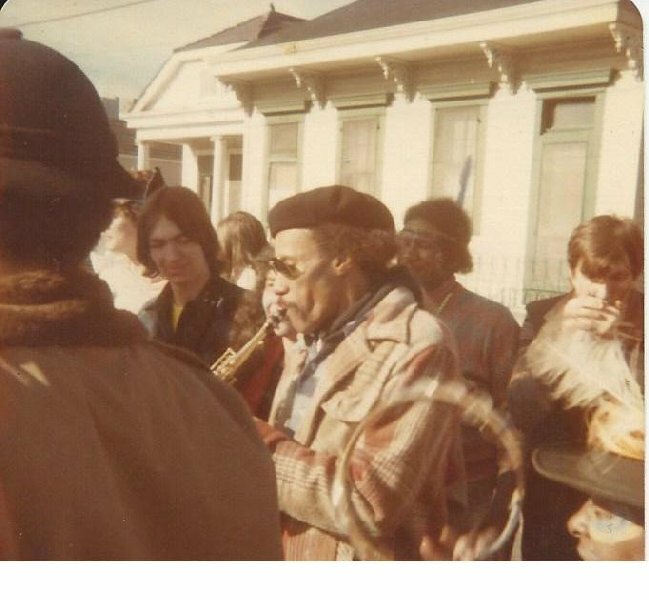 This was right before the Nevilles became major label fodder and began to travel the world in earnest as the pride of New Orleans, the Neville Brothers. We hung out and followed the Wild Tchoupitoulas for a couple of hours before heading the the French Quarter and a party on Royal Street. 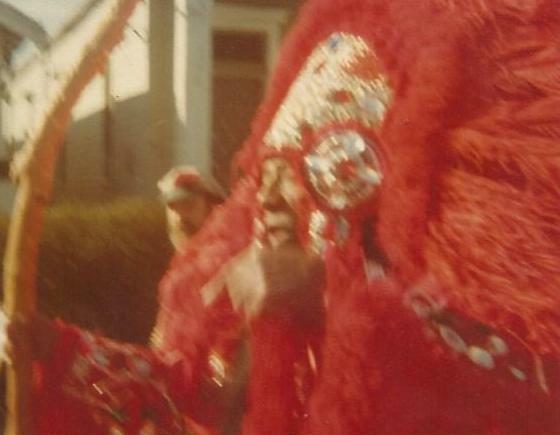 These uptown Mardi Gras Indians were followed by a crowd of about 20 people. It was really an enjoyable aspect of Fat Tuesday that year. Since that time, we’ve gotten into a bit of a fun rut on Fat Tuesday. We set up on St. Charles for Rex and the Trucks, and catch some of Zulu on Jackson Avenue before. 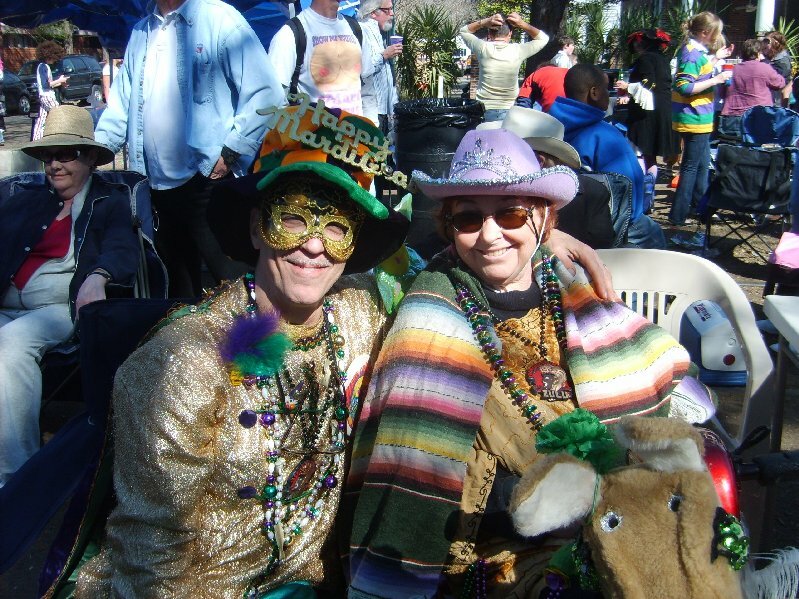 There is so much to do and see at the New Orleans Carnival you can hardly go wrong, as long as you travel in a small group for safety reasons. We always bring a number of really excellent foods and drinks for Fat Tuesday. We BBQ, bring hot gumbos, sushi, traditional desserts like king cakes, mandel brot, decadent chocolate cakes, chocolate babka, etc. Not all of that each year, but I always make a half dozen Po-boys in advance for guests and friends who show up during the number of hours we’re on St. Charles enjoying the parades and trucks. 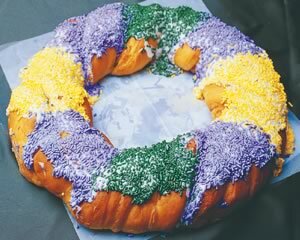 We always bring a king cake, that’s positively necessary. Mardi Gras Recycling About to Take Off!! 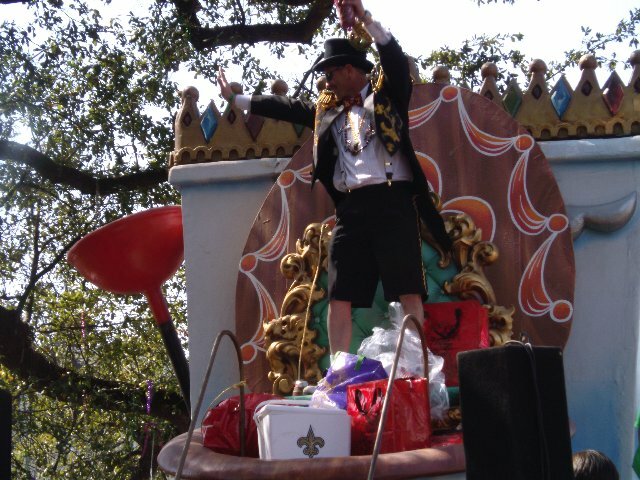 Our New Orleans City Council is considering a parade proposal that would let the crowd throw back beads at specially designed bead recycling floats. This is an excellent idea whose time has certainly come. I saw such a float at the end of some parades in 2012. 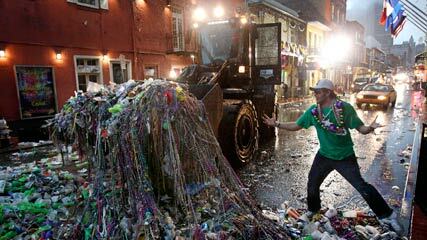 There’s a very cool documentary about where our beloved Mardi Gras beads come from. Mardi Gras: Made in China is all about our beads and the China connection. Here’s a clip from youtube.com. That’s a lot of wasted beads! Even though there’s been a law on the books banning parade goers from throwing beads at floats, that hasn’t stopped anyone, when the right float goes by. Bacchus’ Kong series of floats are all targets of beads.Tucks’ toilet float is another serious target. 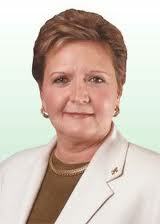 Councilwoman Susan Guidry, a big recycling champion, is behind this effort. 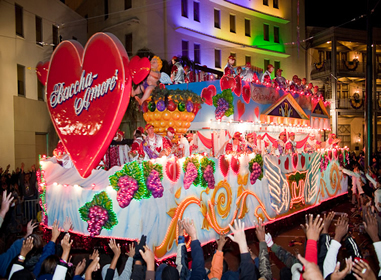 The council could pass the ordinance very quickly in time for the Carnival 2013, or let it sit until 2014.
throws and throws in general.